A lot of gamers have experienced the Jackbox Party Pack titles. 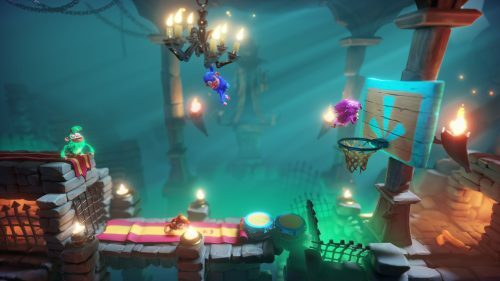 These games are aimed at the casual gaming market and have players compete against each other in a series of wacky but accessible mini-games using their smart devices. PlayStation has followed suit with their PlayLink brand, which has a similar concept but brings the experience exclusively to PlayStation 4 systems. Chimparty is the latest entry for the PlayLink series and by large it’s an engaging but short lived title. 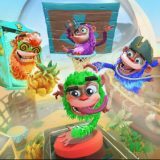 Chimparty is all about controlling wacky monkeys who play mini-games together. There is no story mode to speak of, however there are four gameplay modes: Game Board, Solo Challenge, Random Mode and Custom Game. Game Board is the main multiplayer mode which supports 2-4 players. With a roll of the dice, the player in last place will move that many places on a board and then the space they land on will decide which mini-game everyone plays. During the mini-game you are awarded with 1-4 stars based on how you perform, and then once the results are in players will advance on the board the same amount of spaces. Solo Challenge is a one player mode set on the same game board, but this time players must outrun a giant orangutan. Random Mode lets you play a random assortment of mini-games while Custom Mode lets you create your own playlist. Like other PlayLink games, Chimparty requires each player have their own smart handheld device including iPhones, iPads and most Android phones and tablets. Players are required to download the free Chimparty app from the App Store or Google Play Store and connect to the main game via the household’s WiFi connection or, failing that, the PS4 system’s local WiFi hotspot. The main ‘hook’ of Chimparty is that each mini-game is controlled with only simple taps of the device’s touchscreen, making the title accessible to gamers of almost every age group. Although, given the controls could easily be transferred across to a standard PS4 controller it’s disappointing that there wasn’t an option to use both controllers and smart devices – there are some families out there who would have multiple children and not enough phones to go around. The game features a total of 18 mini-games and all of these also have different theme variations such as jungle, haunted mansion and pirate themes. The mini-game quality is a mixed bag, not helped by the limited single-button control scheme. For example, a lot of the mini-games will start with the monkey being stationary and an arrow moving back and forth to indicate the desired direction you wish to travel. Pressing and holding the button will stop the arrow and then indicate a changing power level of a jump your monkey will make. Letting go of the button will force the monkey to travel in that direction. This particular mechanic is recycled for many mini-games; one has players collect rubber ducks in a pond, another has players jump around a room to break vases for points and another is a monkey version of basketball where you have to get your monkey through the ring. These mini-games tend to be let down by the lack of precision of the controls and mobile phones. As you’re not in direct control of that arrow you’ll often mess up the angle of your jumps, which can be frustrating. There are other mini-games which don’t require quite the same levels of precision and are arguably the best of the bunch. These are the free-running style mini-games where you jump by pressing the button to avoid obstacles and collect bananas for points. Chimparty is at its best as a multiplayer game with friends. Like all mini-game collections there’s something appealing about playing off friendly rivalries and just chilling out on the couch. This title certainly has its charm and novelties which will appeal to some, but be warned this quickly becomes stale within a few hours. Arguably what makes Chimparty accessible to everyone – the single button controls – also means that it doesn’t throw anything new at players and gets repetitive. Without the mayhem of friends and family for heated multiplayer sessions, the game is ultimately a complete drag for anyone wishing to tackle this solo. Visually, Chimparty is a very colourful and surprisingly detailed game. 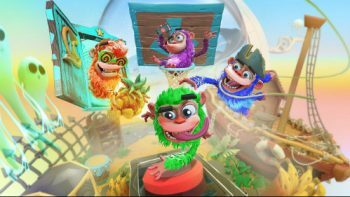 The monkeys in particularly look amazing with their fur and wacky faces which will appeal to both kids and the young-at-heart. 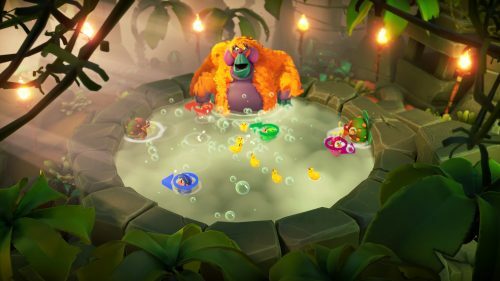 There are lot of bongo and drum sound effects used as well, creating an appropriate jungle vibe and keeping the atmosphere full of energy. 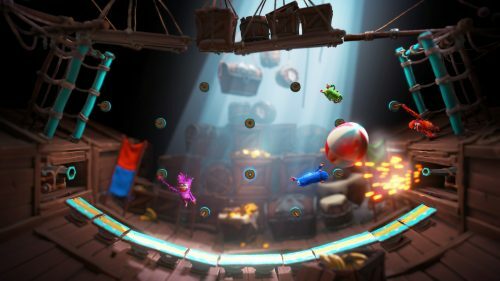 Like other PlayLink titles, Chimparty is a highly accessible multiplayer game that almost anyone can play. It has a simple one-button control scheme, colourful and wacky characters and is genuinely fun when you have a couple of mates over for drinks. Just keep in mind that its accessible nature also means the mini-games can get repetitive, so there’s a high chance you will quickly move on to other games.